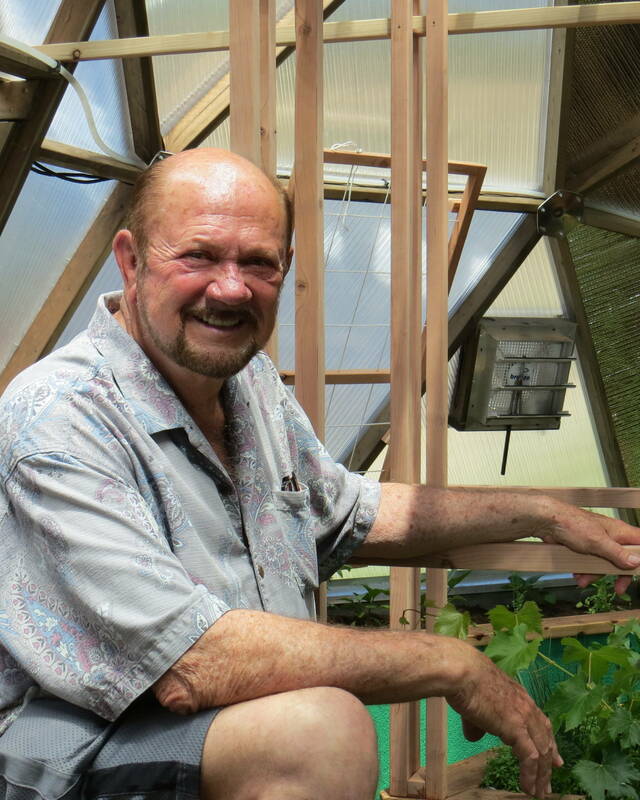 Robert Hilger, founder of Sunshine Gardens, is a big man with big vision. His gentle presence and compassionate heart are backed by a fierceness in his eyes. A fierceness springing from knowing what you want and possession of resolve to get it. He means business. He is the kind of guy you want on your side. Most people just call him Bob. The residents of Sunshine Gardens are lucky to have Bob on their side. 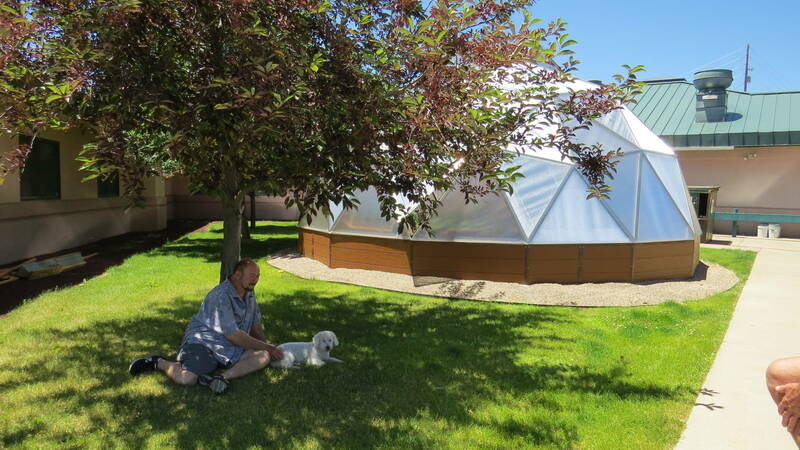 From my brief and pleasant meeting, touring Sunshine Gardens and their newly erected 26′ Growing Dome®, I could tell he is they type of guy who will not take no for an answer when it comes to his thoughtful and compassionate mission. 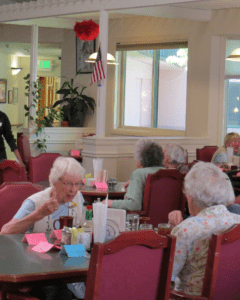 Sunshine Gardens is an assisted living facility in Durango, Colorado. A thriving Senior Community. Over 20 years ago, Bob transformed a 6 1/2 acre scrap metal yard on the corner of 32nd street and Sunshine Court into the beautiful inviting landscape of Sunshine Gardens – a place where people want to be. Assisted living is relatively new on the scene as an alternative to traditional senior housing. Not too long ago, our elders stayed at home with family, or made the sometimes uncomfortable move to nursing homes. In particular circumstances, nursing homes are the best and only option. However, for seniors who desire assistance while maintaining independence…. …assisted living strikes an ideal balance. The community of Sunshine Gardens cultivates an environment for seniors to remain active, safe, and continue to grow and expand at a critical stage of life. With the promise of Baby Boomers reaching retirement age over the next few years, the nature of assisted living is changing…and in my opinion, Sunshine Gardens points the way. Assisted living is moving toward creating environments which care for the “whole” person. Communities where people are engaged. Communities where contribution is recognized and utilized. A place fostering meaningful relationships with people, with community, and passion for life. 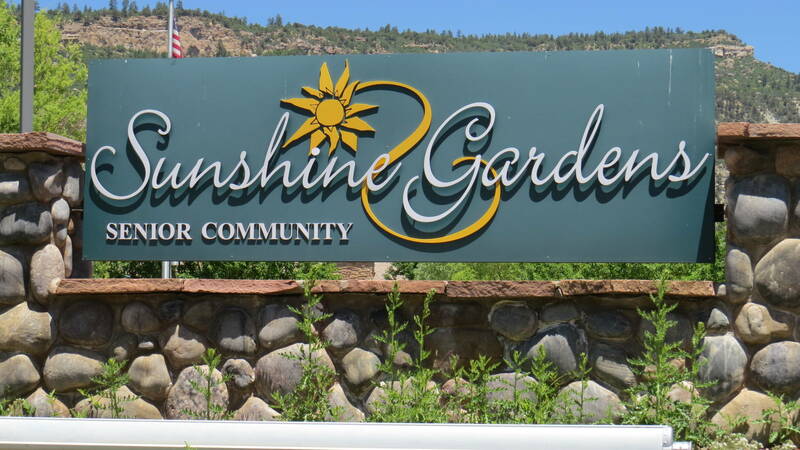 Sunshine Gardens creates a holistic experience for its residents. It’s a place to continue to grow, to dream, act on ambitions, and to develop meaningful connections. 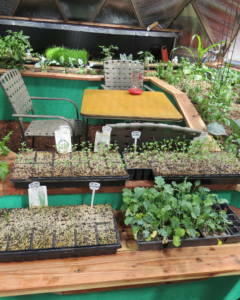 A place to inspire the local food movement. You’ve heard of Farm to Table. 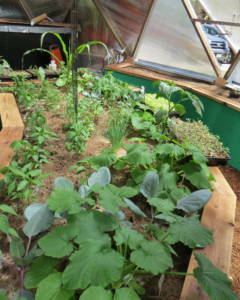 You’ve heard of Farm to School. 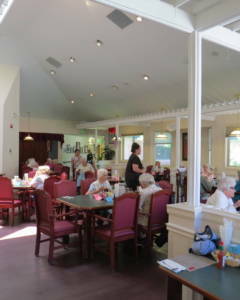 The atmosphere in the Dining Room at Sunshine Gardens at lunch hour feels just like that…a dining room. Not a fill the seat, fill the bellies attitude. No, the lunch hour feels more like fine dining at a restaurant. The only difference is everyone seems to know each other. It’s a community fine dining experience. 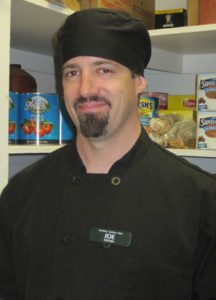 The kitchen staff are sharp…focused, and inspired. Sort of like watching a fine craftsman at work. Before long, they are going to exit the back door of the kitchen…walk about 20 steps…and harvest greens, herbs, and vegetables for their fine dining room. And they will be able to do this year round! 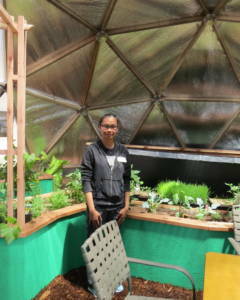 This past April, Sunshine Gardens purchased a 26’ Growing Dome. 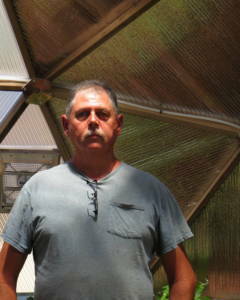 Only a couple short months later and they are harvesting…and the dome is flourishing. 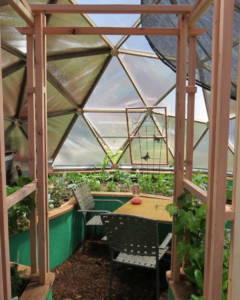 Sunshine Gardens reap the benefits of nutritious, organic, home-grown food for its dining room. 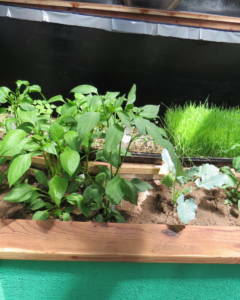 It also facilitates one of the most natural, rewarding, and engaging activities….gardening. 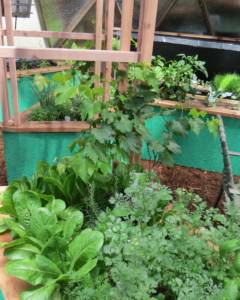 The benefits of gardening are many fold. We know this. It fosters healthy exercise, meaningful relationships with nature, and is known to cultivate powerful endorphin’s which leave us feeling more alive, more engaged, more thankful, and more peaceful. With the support of dedicated and determined staff…. 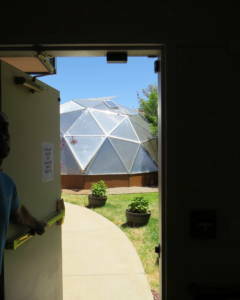 …a garden club is forming to maintain the Growing Dome. The collaborative efforts of staff and Garden Club will keep the kitchen supplied and give the residents of Sunshine Gardens a perfect environment for connecting with the power of gardening. Robert Hilger transformed a barren wasteland, a forgotten metal scrap yard, into a living, growing landscape for the betterment of seniors. Now he is transforming an outdated barren mindset of institutions which may not serve us to our highest potentials. that places like Sunshine Gardens exists. I am thankful there are people out there who remember we can help serve people. Real people. Not demographics, but people. It is inspiring to see we can choose how societal institutions serve us. Thank you Robert (Bob) Hilger. Thank you Sunshine Gardens. And thank you to the people working and living a new direction for senior living. And who’s to say what “prime” of life is anyway? Bob, your a hero by doing the right thing! Wish that I could meet you and see the place! Such a great idea that isn’t done in Florida because they’re too busy doing it all wrong just to get all their money. What a phenomenal idea! It’s amazing no one thought of this before, except that most facilities are created to house people and make money with no regard for the quality of food. 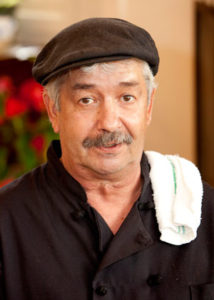 Hats off to Bob Hilger. May others be inspired by your pioneering spirit.